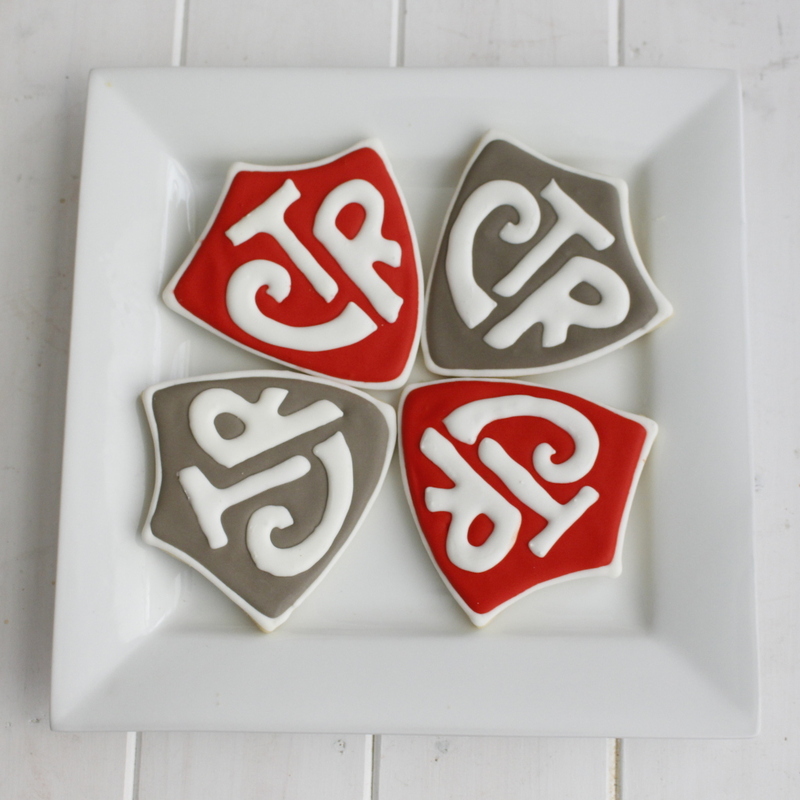 These red and grey CTR cookies were the last CTR cookies I made. And they happened to be for my daughter’s baptism. So they are super special to me! However, I’m just about to make another set. I thought I’d bring you along for the ride. CTR stands for “Choose the Right” and is an acronym used often in the LDS (aka Mormon) church. It is similar to WWJD. It is to remind us to always make good choices. And we also have those Great to be 8! orientations, for which you want a special treat, but you have no budget for 😉 You know what I’m talking about, if you’ve ever planned one. If you are adventurous and want to make these for your special occasion, then you are in the right place! They are bit labor intensive, but hey it’s a labor of love, right? 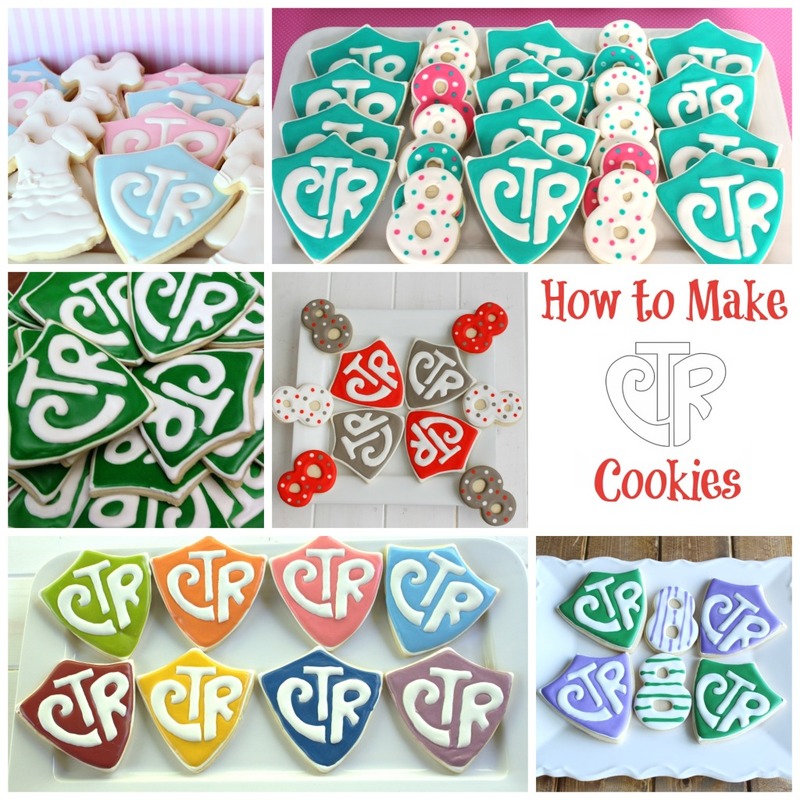 This tutorial assumes some basic knowledge of this type of cookie decorating. 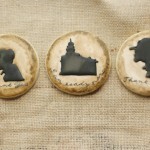 If you are a newbie, I would suggest visiting Lilaloa and Sweet Sugar Belle’s websites. They have lots of information for beginners. 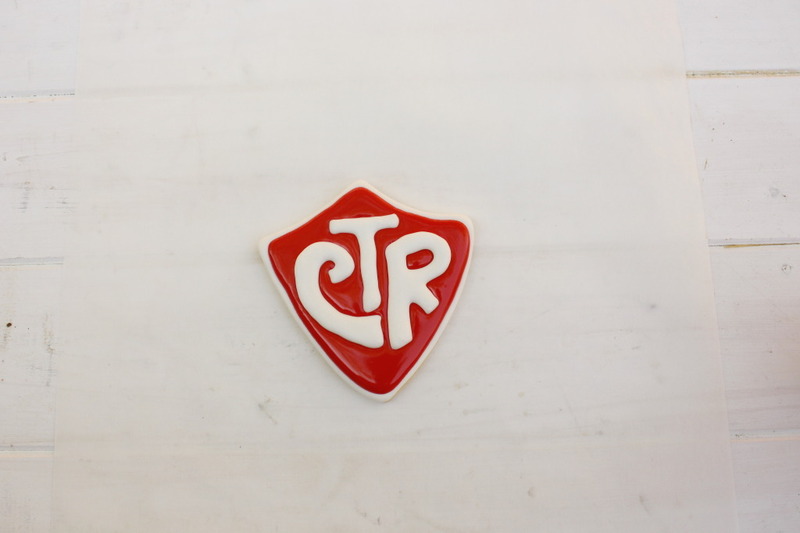 The first step is to make the “C” “T” and “R.” When you dry royal icing on wax paper to put on a cookie later, it is called a royal icing transfer. Transfers need a while to dry (at least 24-36 hours), so you need to do this beforehand. Probably before you even bake your cookies. I make bunches of these with any leftover icing I have. Then I keep a container of them. They store for a very long time. 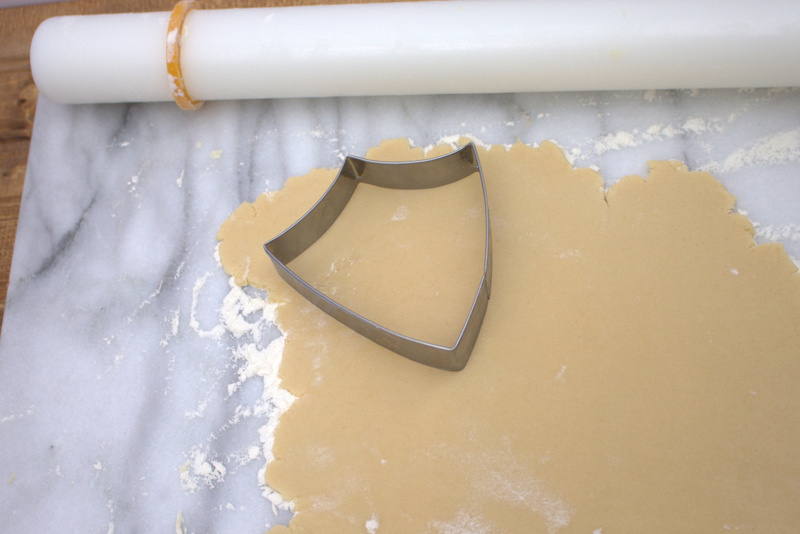 I use the 4″ version because that is what fits my cookie cutter. I printed a couple sheets and cut them apart so I could fit more on my cookie sheets. 2. 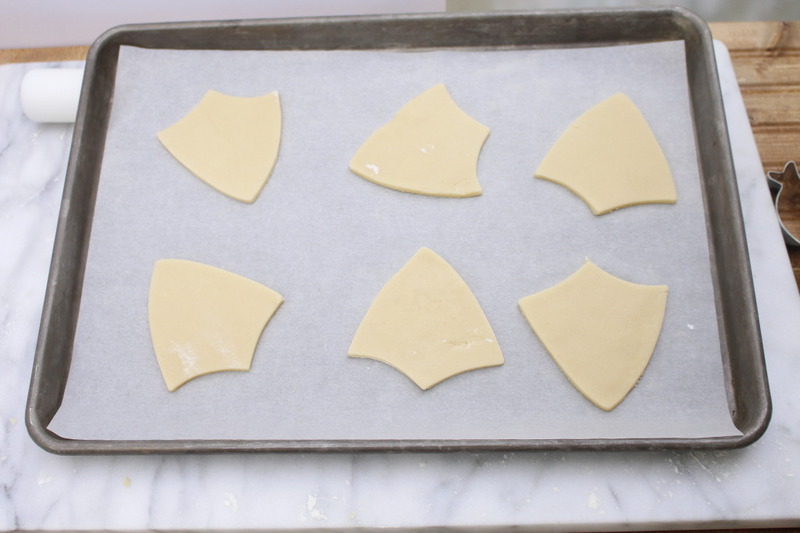 Tape the patterns onto the back of a cookie sheet. Then tape a piece of wax paper over the patterns. Make sure the wax paper is as smooth as possible. 3. 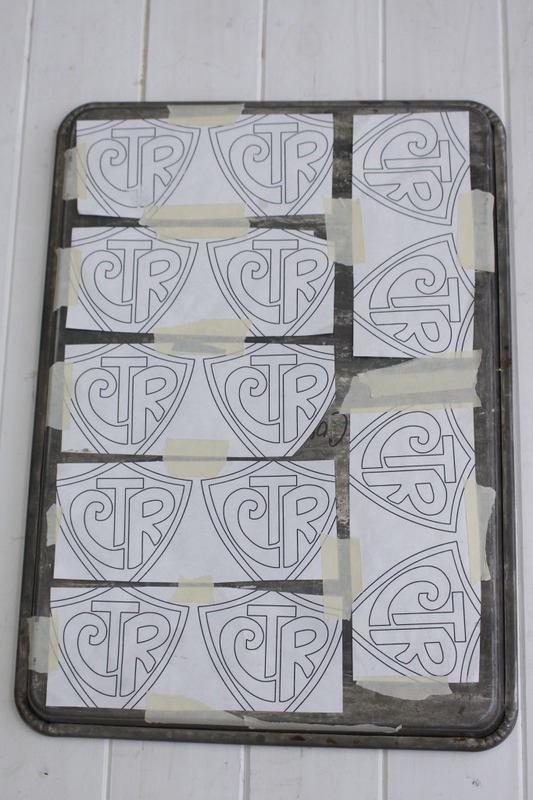 Using white 20 second icing, pipe the CTR letters using the pattern as a guide. Use a toothpick to pull the icing to the corners of the letters. 4. Let these dry for at least 24- 36 hours. More, if you live in a humid climate. 5. Carefully remove the transfer from the wax paper. Don’t try to pull the letter off the wax paper, but rather peel the wax paper from the letter. Here is a video from One Tough Cookie that shows you how to do this. You will break some of the letters. It is just a fact of life. So make extras. 6. Make sure you change the wax paper in between sets, don’t try to reuse it. Otherwise they won’t release easily from the wax paper and you will break more of them. Roll out and bake your cookies. I use this recipe for my cookies. I got the cookie cutter here. 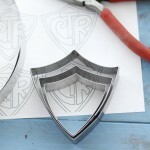 I have also seen this shield cookie cutter on Etsy and another version at Gygi’s in Salt Lake City. Or you can make your own with these instructions. Bake your cookies. Let them sit for 24 hours if possible. This is supposed to decrease the chance of your icing developing butter bleed. Here is the recipe I use for royal icing. 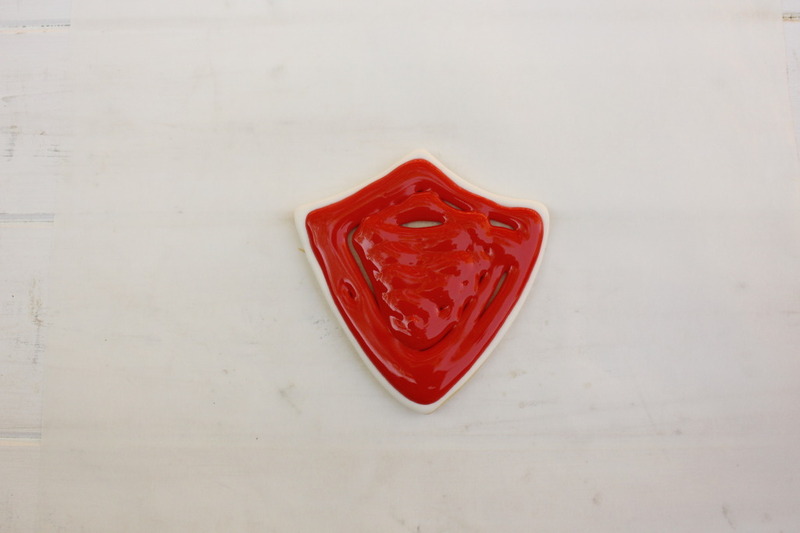 And here is a great link that talks about icing consistencies. You will need white 20 second icing and the color of your choice flood-consistency icing. 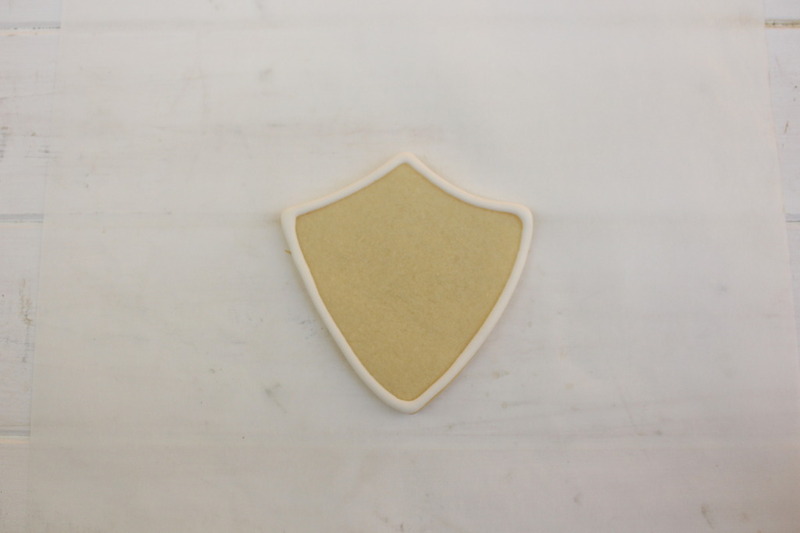 Outline the shield with a thick border of white icing. I used a tip that doesn’t have a number, but came with a cheap set of icing bags. This is a 20-second white icing. Let this dry for several hours, this will decrease the chance that your colors bleed into the white. 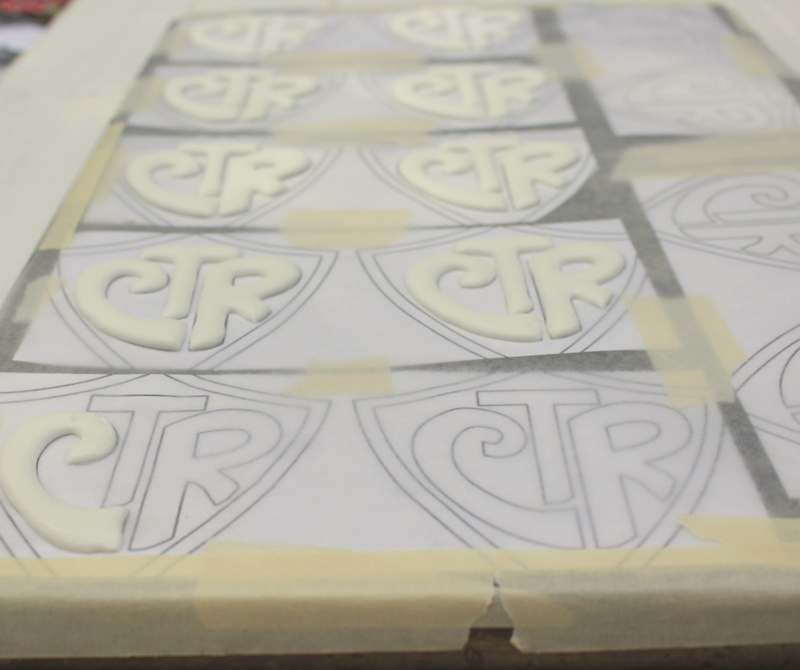 Using flood consistency icing, fill the middle of the white outline. Use a toothpick to smooth the icing and to pop any air bubbles. *A note on color. If you want the classic CTR green color, use Americolor Leaf Green. It is a perfect match. If you don’t want that green, do whatever you want. 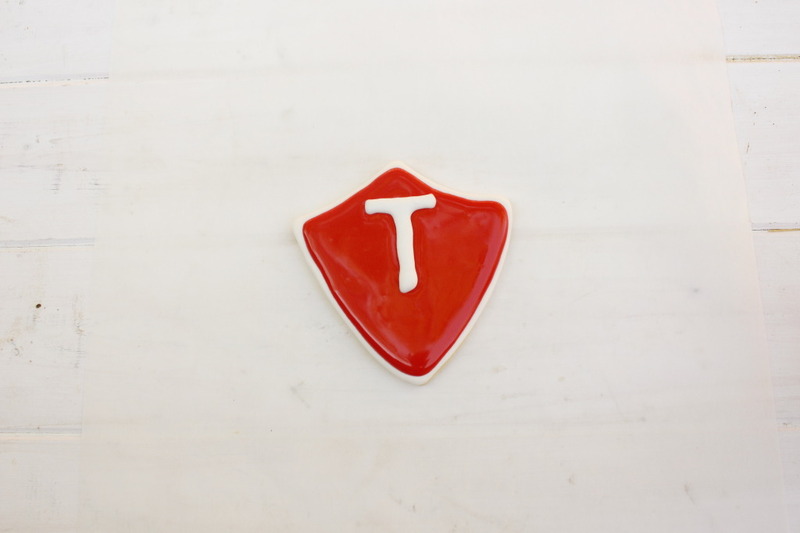 Carefully place the “T” in the center while the icing is still wet. I just use my fingers and drop it carefully on top of the icing. You can move it a little, but not much, once it’s on there. So be careful. So if you are keeping track, let me give you a more concise time line. You need to start these 4 days ahead of when you need them. If you are in a crunch you could make the cookies and transfers on the same day. You can also decorate your cookies the same day they are baked (once they are cooled) if you are really in a rush. But this is my timeline for decorating them. Deliver them and be ready to impress everybody! Let me know if you have questions. Hopefully you can follow along. Can you please email me ordering information? 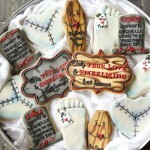 My daughter would love these at he baptism! 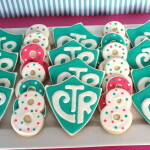 I’d love to see your HLJ cookies! These cookies are just beautiful. Do you take orders? My daughters baptism is coming up and i would love these to be part of that day. Please help! Thanks for the tutorial! I made these recently for my sons baptism. I have a question though. After a day of drying the white letters took on a green tint from the icing underneath. Do you have any tips on preventing This? Thanks! This is a common problem and one that has happened to me many times. There are two things that I have noticed helps with this. 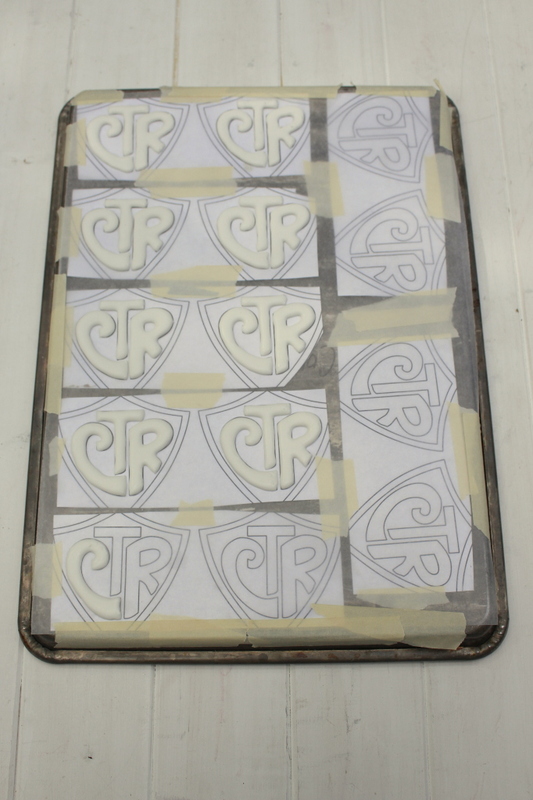 Making sure you royal icing transfers are allowed to dry A LOT. Sometimes I will remove them from the wax paper and let them sit out in the air for an additional day. This is especially important if you live somewhere it is humid or rainy. Next, I’ve noticed that you get color bleed when the icing you use to make the transfers is a little thinner or if it is is whipped more, so it’s not as dense. The more airy it is, the more the wet icing underneath can seep up into those tiny little holes and then the color can bleed through. 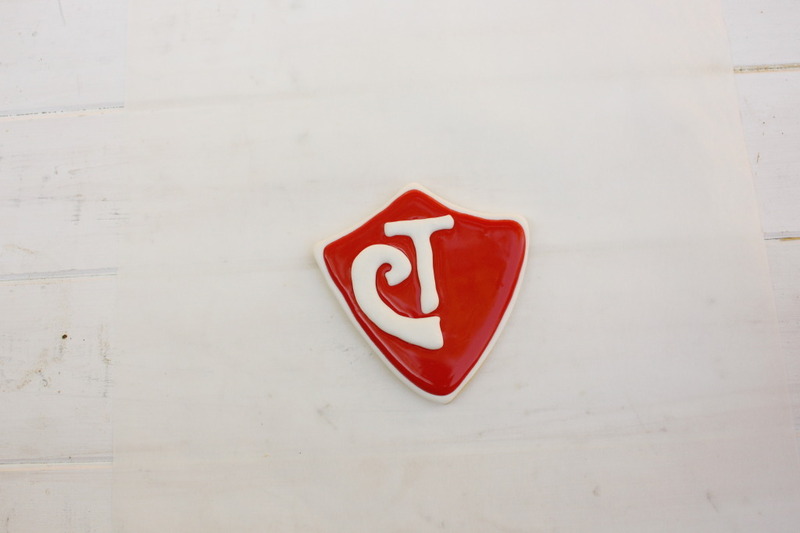 I have also heard about painting the bottoms of the transfers with corn syrup before placing them on the cookie, but I haven’t ever tried that. Love the tutorial! Tying making cookies for the 1st time. But I saw these and had to try. For all of your drying times, do you have everything covered or out in the open? If covered, what do you use for drying so many things at once? Just leave them out in the open for the most part. If I need to cover them, I just leave them on the baking sheet and cover it with foil. I think I am going to attempt these for my son’s baptism. How far in advance can you make the CTR transfers and store them? The transfers can be made a really long time before you need them. Weeks, probably months. Good luck! These are a couple links for tips on shipping cookies. Hi. This is my first time using royal icing of any kind. I just want to clarify something before I begin. 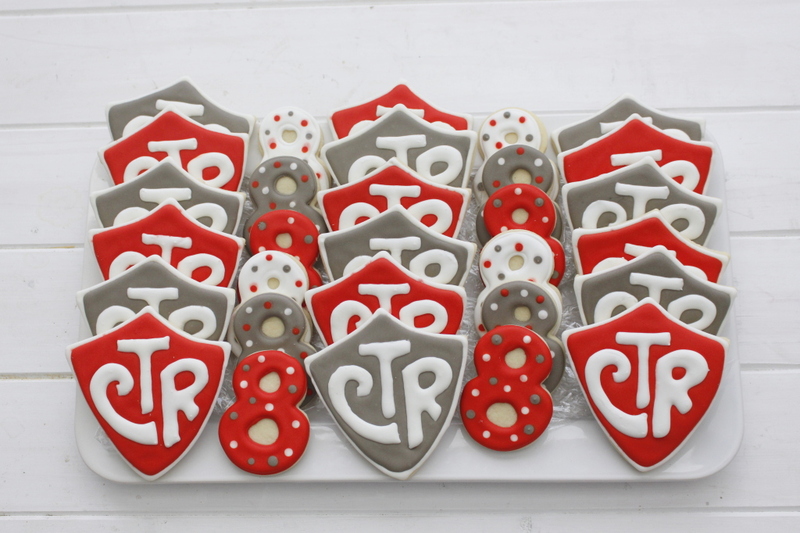 The CTR letters using the 20-second icing, right? Does the outline of the cookie use 20-second icing too? Another clarification for my novice self – you start out with the royal icing recipe, then with that, make the 20 second and flooding using water? When you use 20 second icing, you generally don’t use that with any other consistencies. So you outline and flood with the 20 second consistency. Can I order these…please? Thank you! 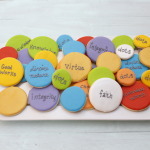 Love these cookies, I’m making them for my daughter’s baptism in a couple of weeks. I just finished making 60 transfers, whew! I have a few questions though. 1. Was planning on making the cookies ahead of time too. Can I freeze them? If I do, should I freeze immediately after cooling or leave out the 24h? How long after freezing would it be safe to decorate? 2. When you decorate the cookies, you recommend letting them dry for 24h. Will this dry out the cookie or do I dry them in a air tight container. I know once they are dry I can put them in a container for a few days but I’m just worried about drying out the cookie while the frosting dries. Hi Clarisa, sorry it’s taken a few days to respond. 1. Are you freezing the cookies before decorating? If so, you can freeze them as soon as they are cool, you don’t need to leave them out. If you are decorating, then freezing, they need to be nice and dry before freezing. 2. Leaving the cookies out to dry for 24 hours usually doesn’t dry out the cookie. Sometimes, I will cover the whole pan with aluminum foil, just to be safe. Once the frosting is on top of the cookie, they don’t dry out quickly because the frosting creates a seal on the top of the cookie. Thank you so much for your wonderful tutorial! I am so excited to try these for my son’s baptism coming up in April. Would you mind sharing where you got your number 8 cutters or what size they are? Thanks so much for sharing your talents with the rest of us not so talented! I have two different “8’s” One came in a set from wilton. One I got from Gygi’s in Salt Lake City. One is 2 inches one is 2 1/2 inches. Amazing idea!! thanks so much for sharing! !